If you have been following MYSUN on our social media channels or generally keeping an eye out on what we have been up to, you would be well aware of the fortnightly series, where we bring to you some cool applications of solar. In our series so far, we have seen a solar-powered tuk-tuk and a solar-powered boat. This time around, we thought of moving away from the world of transportation towards something that has been making a lot of headlines and turning heads. In this edition of 'Interesting ways the world is utilising solar' we are set to feature solar rooftop tiles. As you would know rooftop solar is very dear to us here at MYSUN and we are excited by the potential of this latest unveiling by Elon Musk, the CEO of Tesla. The idea behind solar rooftop tiles, in theory at least, looks to be just the right solution for those who are worried about the aesthetics of their rooftop when going for a solar panel installation. There is another myth that added weight of a solar system could lead to a collapse of roof altogether, and while the truth could not be far away, having your rooftop made up of tiles that are sufficient to produce power without the need of an over-bearing structure is sure to give a lot of people more peaceful nights when looking to make the decision. As a concept it looks wonderful and something that would gauge a lot of interest, but you wonder, just like other Tesla products, whether it is a solution for the future more, than being a solution for right here, right now. The product is expected to land in the markets in time for the next summer. If you are design conscious you would be glad to know that the solar rooftop tiles can indeed be manufactured in a range of styles to go along with the overall design aesthetics of the home. Some of these include: Tuscan, slate, textured, and smooth. 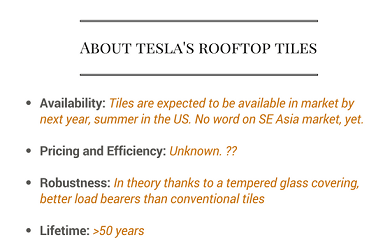 There is little information on the pricing of the tiles, but Elon Musk did add in his keynote that the cost of going with solar rooftop tiles would be cheaper than the traditional roof plus solar rooftop solar system installation. He did add via his Twitter feed that, "Solar glass tiles can also incorporate heating elements, like rear defroster on a car, to clear roof of snow and keep generating energy". If you are worried about the robustness of the tiles, in theory at least, they seem to be able to stand load better than the conventional tiles as seen in the video below thanks to the tempered glass covering. According to Musk, they should last you as long as 50 years. 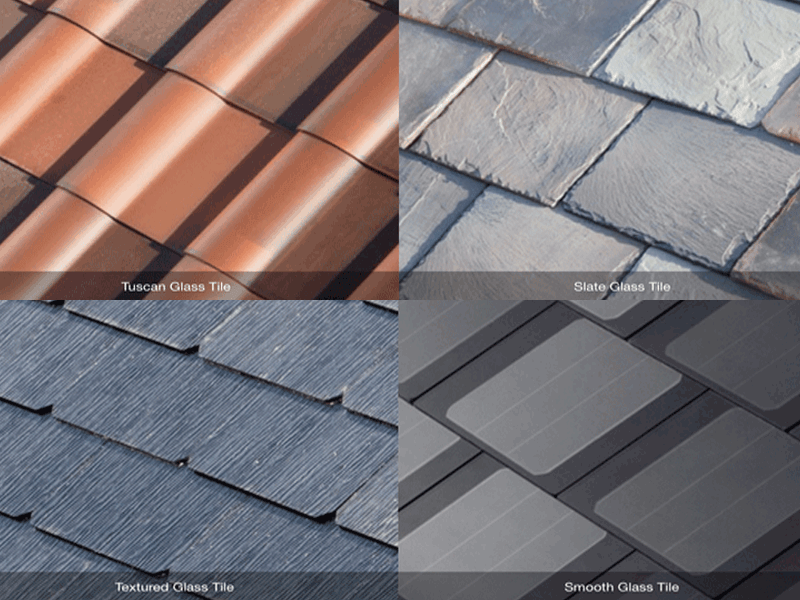 Even though these shingles or solar tiles look quite attractive aesthetically, and promise to be simpler in terms of installation, they are likely to be less efficient and more expensive than the traditional rooftop solar systems in terms of energy generation and upfront costs respectively. So this may end up being a rich man’s solar system who anyways may not want too much savings on energy bills. Purely from an Indian market perspective, which traditionally is much more price sensitive, it may be a few years before such fancy products become mainstream. Having said, the traditional rooftop solar is all set to go mainstream in the next couple of years due to the huge price arbitrage solar power offers today in comparison to what consumers pay for grid power today.